Every summer me and my husband go on holiday to the Alps. Our favorite place there is called Ostallgäu, which is in Bavarn Swabia. The area is popular for its beautiful landscapes and amazing food. There you will also find one of the most beautiful castles: Neuschwanstein. Exactly this castle was an ispiration for the Sleeping Beauty Castle that we all know from Disney movies. This area is worth visiting for many reasons, but if you are already reading this post you are convinced to go there, so I will not try to convince you! Just think of that: there is a reason why I go there every year to charge my batteries. But lets get to the point: What you must to eat there? Allgäu has to offer very good diary products, which are big economic factor for this region. Last year I even worte a post about cheeses that you have to try in Allgäu. Other then this Allgäu has very good quality of meat, especially wild meat. Most of the meals are made with milk, cheese and flour. They make amazing Nudle Dishes, Spätzle, Knöpfe and Maultaschen. They also eat a lot of saurkraut and meat of course! 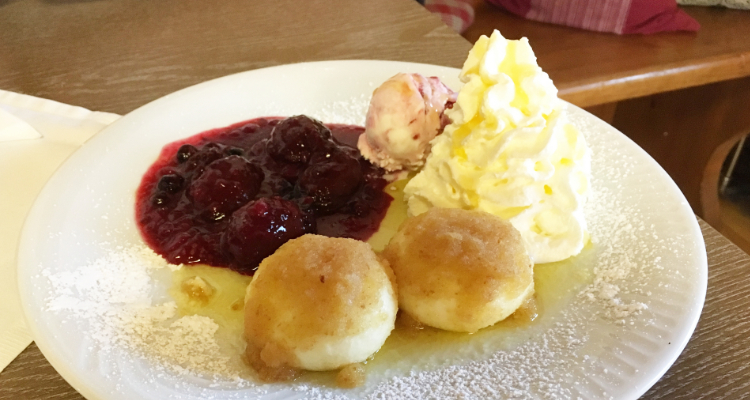 But apart from this they also have something for your sweet thooth: Apfelküchle with Vanilla Ice Cream, Knödel with plums and on the Austrian border also Kaiserschmarrn. 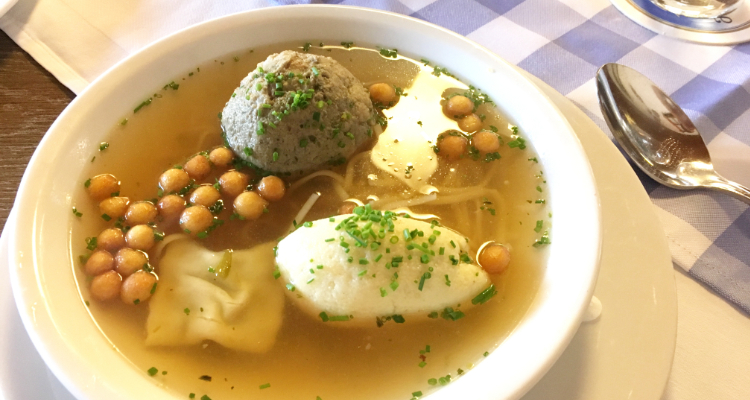 In Baveria is the soup served with noodels, meatballs, boiled dumplings made of bread and bone marrow, semolina dumplings, beef liver boiled dumpligs, spätzle or roasted peas. The soup its great if you are not too hungry or you want to have some space for the dessert! (I certainly recommend to leave some space for the dessert!:)). 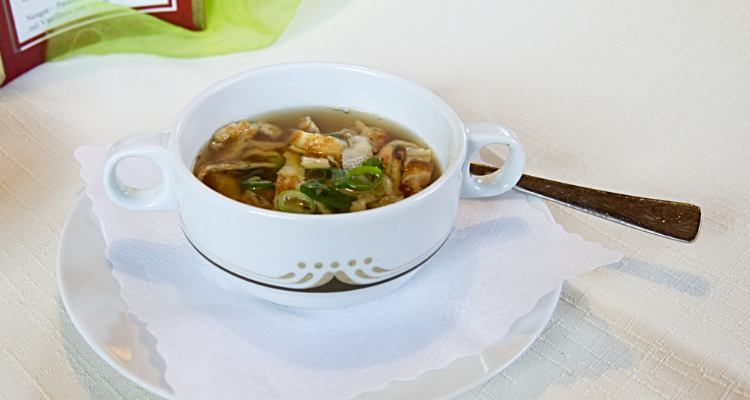 Flädlesuppe ia a clear soup, usually beef broth served with plain creps, cut into stripes. 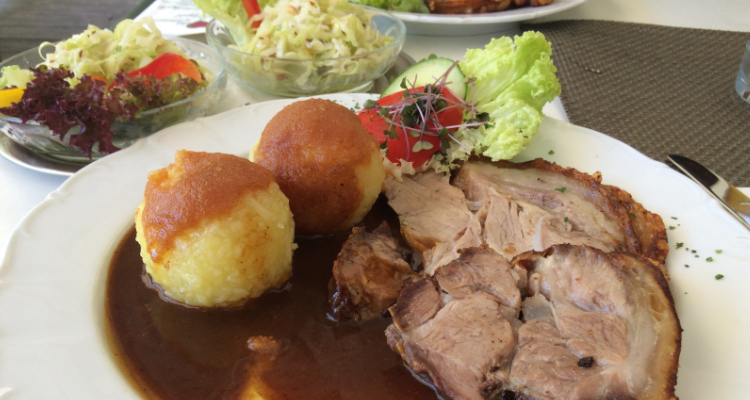 The dish you can also find in Schwaben. 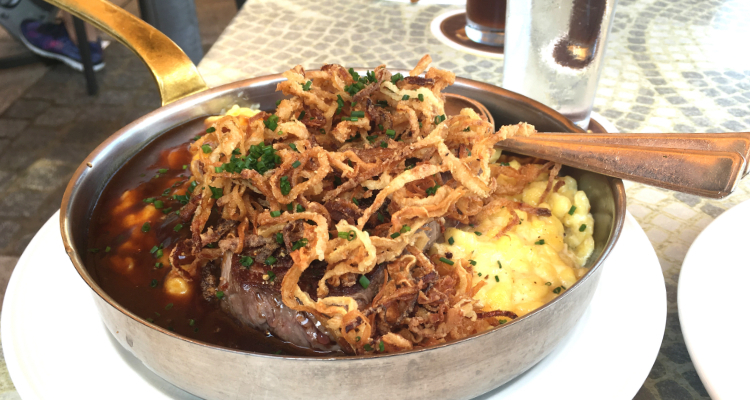 Zwibelrostbraten is a Roastbeef served with deep fried onions. In Allgäu is served with Käsespäzle (German noodles combined with 5 different cheeses) which are really the best noodels on the planet. If you wonder how the Käsespätzle are made, here is the recipe. 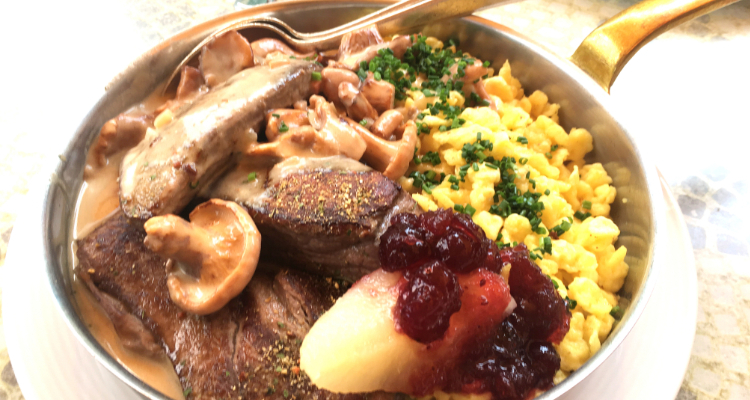 In one of my favorite restaurants in Ostallgäu the Zwibelrostbraten is actually a rumpsteak served with amazing sauce, rosted onions and Käsespätzle. In Bayern there is also popular goulash made of wild meat. This is also something what I would recommend you to try. There is really nothing better then soft meat, delicious sauce and pear with some lingonberry jam. This is a highlight for everybody who has a sweet tooth! This my absolute favorite dessert from Allgäu and I would say you better dont leave this region without trying those little dumplings. 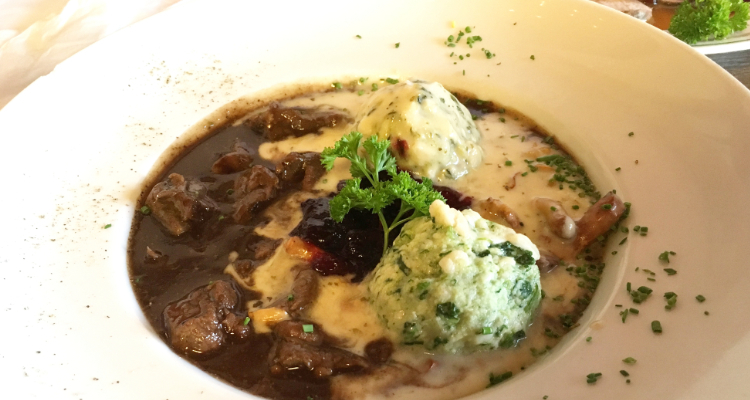 Zwetschgen Knödel – dumplings made of flour, curd cheese and plums are incredibly soft. Usually they are served with cream, red berry compote, breadcrumbs and ice cream. Dampfnudel is a sweet roll made of flour, water, yeast, salt, butter and sugar. They are cooked in closed pot with a little milk and butter, as soon as the liquid evarorates the brown crust come about at the bottom of the Dampfnudel. 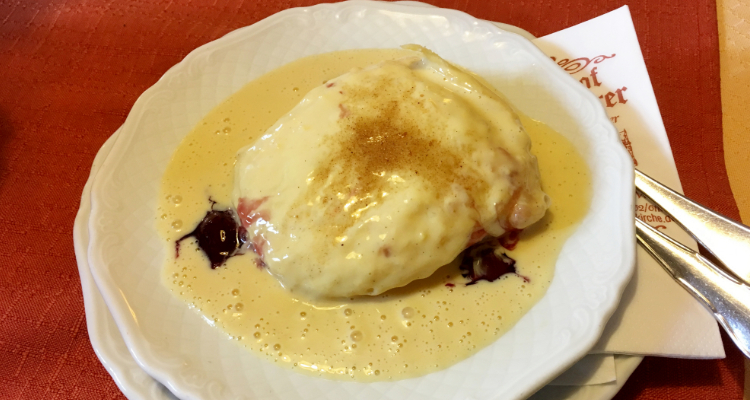 Dampfnudeln in Bavaria are served as a dessert with vanilla sauce and boiled fruit.